High quality toslink fibre optical leads for digital audio interconnections. The TOS type plugs have an attractive silver finish and gold plated inner pins. Great quality fibre optic cables at low low prices. Digital fibre optic lead, featuring 3.5mm type connectors commonly found on MiniDisc players. 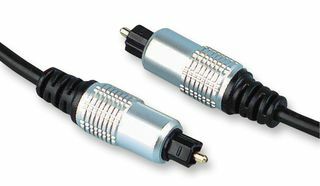 TOS type connectors have a square body and are commonly found on modern audio/video equipment. The Fibre Optic Leads are availble in various lengths.